Job Interviews: How to Overcome Being "Overqualified"
Have you ever gone through the interview process, felt confident that you'd performed extremely well, and then heard these dreadful words: "I'm sorry, but we feel you're overqualified for this position." When I was told that after an interview, several thoughts went through my frustration-fogged mind... What kind of crazy excuse is that for not hiring me? So what if I'm 'overqualified' -- don't employers always want to hire the person with the best qualifications? If I'm willing to take this job, overqualified or not, why is that a problem? This isn't fair! What's the real reason they don't want to hire me? They'll have to go through the time-consuming and expensive process of hiring and training someone all over again. They may or may not make you feel better about being "overqualified," but you must admit those are legitimate concerns. If you get the "overqualified" excuse once, you'll be wary about getting it again. So when or if you apply for other jobs that may be at a lower level than warranted by your background, skills, education and experience, you may be tempted to "dumb down" your resume and omit things like college degrees. But lying about your background is not the way to go. Here's a better strategy: address it head-on. Be the first one to raise the "overqualified" issue with a potential employer. If you bring it up yourself, you can discuss it openly and convince the interviewer that it won't be a problem. They key -- as with every job interview issue -- is to anticipate and prepare. Before you go to the interview, think about what you'll say and how you will convince them that they should hire you, even if you are "overqualified." After explaining how you will be a great asset for their company, tell them why you are applying for a lower-level position. Do not say, "I can't find anything else and I really need a job." Though that may be the case, this approach is a little too honest and will reinforce their fear that you will leave at the first opportunity. "I've always wanted to work for your company [or in this industry], and I'm willing to take a lower-level position to get that opportunity." "It will allow me to use my skills and expand my experience in a new field." "I'm looking for something a little less stressful, with fewer responsibilities, so I can spend more time with my family." "This position provides the stability and long-term growth potential I'm looking for." "The salary is not my top priority. I'd have no problem with earning less than I've earned in the past." Be very enthusiastic about the job. Explain how you can meet their needs now and in the future as the company grows. And most important of all, convince them that you will not quit as soon as something better comes along. If you are convinced that this job would be worth it, you might even try this: offer to sign an agreement stating that you will stay on the job for a minimum of 12 months. Whether the hiring manager actually takes you up on that offer or not, it will definitely make a very positive impression! If you anticipate the "overqualified" issue and address it up front, it will not be a drawback to your success! I promise to use it only to send you the free Career-Life Times newsletter. 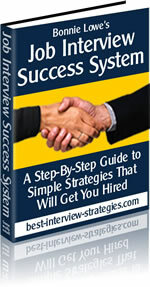 For even more information about job interview questions and how to answer them, consider the "Job Interview Success System." One of the 5 key components of this system is a 31-page report entitled "How to Give Job-Winning Answers to Interview Questions." In addition to giving more tips and strategies on general answering techniques, it lists 45 of the easiest, toughest, silliest and most common job interview questions as well as how to respond to them.